Anyone with an interest in skiing or boarding steeper lines on the Main Range of the Snowy Mountains will love this book. I can’t believe that it took 20 years from its publication before I heard of this wonderful book. I was skiing with my friend Peter this winter and as we talked of the backcountry trips we had done and wanted to do, the western slopes of the Snowies came up. 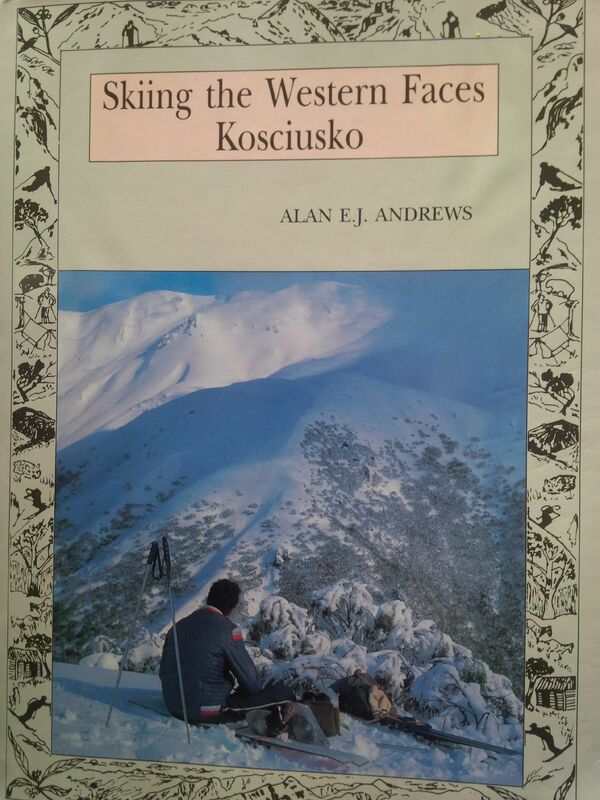 He mentioned Alan Andrews ‘classic’ Skiing the Western Faces Kosciusko, describing it as the Bible of skiing in the area, and providing the ‘tick list’ for anyone interested in the many lines that come off the western side of the highest peaks of the Main Range. Two weeks later I was the proud owner of a copy, a publication of Canberra based Tabletop Press, which has an impressive collection of mountain themed books in its stable. As Alan describes in the introduction, the book is not so much a guide to skiing the western slopes as ‘a companion volume that might instil in you or remind you of its joys’. It certainly does this. In the sleeve notes, it describes Alan as being ‘in thrall to this country’ for nearly half a century. This deep love and connection comes through on every page, evoking the experience of being on these runs while infusing the details of particular trips in particular company or conditions. The book was published in 1993, but has a feel of decades before, through its design, the focus on black and white images, and hand written poems and images. Its genesis was a winters night amongst friends, when it was agreed he needed to write the book and share his experiences and knowledge. The introduction from Snowy Mountains legend Elyne Mitchell, places the time and circles that Alan has moved in, from the early 1940s onwards and the days of the now long gone Lake Albina Lodge. The book assumes people can get themselves to the top of the Main Range as a starting point, and have the skills and competence to out in the biggest terrain Australia has to offer, which is often avalanche prone. This large format book has a chapter on each of his 15 or so main areas, with a hand drawn map of each and gorgeous photos of the slopes. There is enough information in each to place yourself at the top of the run, and identify any cautions or things to look for, and the maps themselves show each of the lines, giving a sense of steepness and vertical drop. 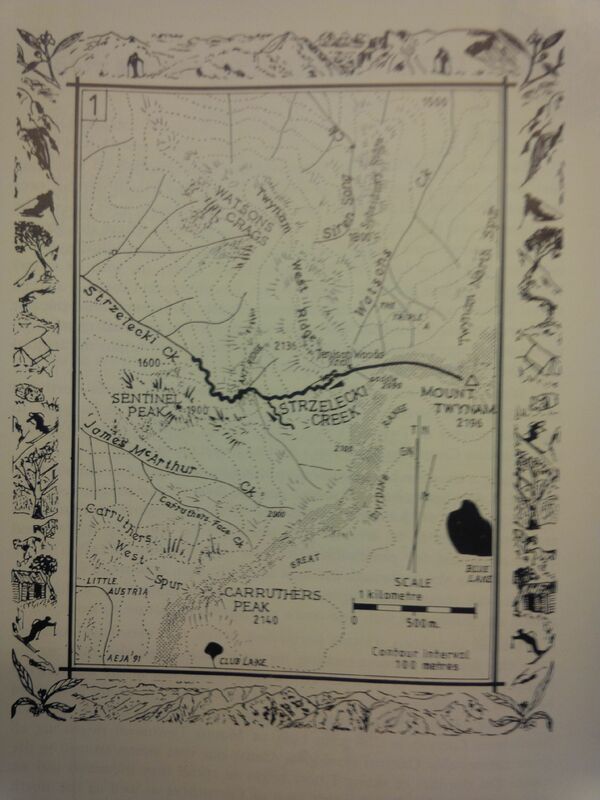 It covers the western slopes from Dead Horse Gap north to Mt Tate. There are some nice diversions into skiing style and gear, the inspirational value of guidebooks, and a nod to the broader culture of those who love the back country mountains. There are also a series of often quite personal poems about many of the mountains, spurs and valleys covered in the book. As Mac Beavis notes in the final word, Alan’s love for the mountains “has grown these 50 years and still grows on, overflowing” and that feeling is manifest in every page of this lovely effort. It really deserves a substantial place in the growing body of serious mountain related literature of the Australian Alps. There is a growing number of online guides to skiing and boarding this area. The recent write up on the Huck and Dyno website of the gnarliest lines in Oz gives suitably focused coverage of the western slopes, and the back country snow wiki also has growing details. In contrast to these, Skiing the Western Faces feels charmingly dated and almost quaint in its layout, and provides a sense of historical depth to the experiences of the current generation who are out on the slopes. Backcountry skiing and boarding can be a deeply individual experience which is ‘outside’ history because people are either absent or transient and the mountains are timeless. Its a lovely experience to gain some insight into people who came before us, on different gear but with the same desire to get out in big and beautiful mountain terrain. And as Mac says in the final chapter, after we have all been and gone, ‘the Western Faces will remain, an inheritance to captivate and enthral … skiing the faces will continue on into the far future’. It is available for $45 from Tabletop Press. Thank you Cam for a deeply knowing and reverential review. I am glad you have imbibed and identified with the spirit and the aesthetics of the book. It is not often one gets such a heartfelt and rewarding response. I published and designed it for Alan in the early 1990s. The book has been selling steadily over the years but particularly in the last five. A ‘young mob’ has discovered it. There are not that many copies left. Alan is alive and well (aged about 86) living in Mona Vale in Sydney. I will send him your review. He is not on the internet but is happy to ‘talk’ to people on the phone or in letters. I skied with Alan from Illawong in the 1980s. Having published ‘Huts of the High Country’ (1982)and ‘Kiandra to Kosciusko’ (1987), he responded to my enthusiasm about high country history, photography, book publishing, writing, etc by asking me to design, produce and publish ‘Kosciusko – the Mountain in History’, ‘Skiing the Western Faces’, ‘Earliest Monaro’ and ‘Rainforest and Ravished Snow’. He gave my infant Tabletop Press a great start. Alan thought the first title (KMH) didn’t have quite enough room to breathe. Together we went through his vast collection of mountain books (his wife and son run a second hand bookshop) and came across ‘Over Welsh Hills’ (1945) by F S Smythe. It became the inspiration to which we added further layers of poetry, drawings and maps. Now it is considered a hymn of praise for much more than the highest and steepest slopes in the Australian high country. After producing Alan’s books (and continuing to sell them to shops and others) he gave me a rare copy of ‘The Call of the Mountains’ (1952) by Colin Wyatt and thanked me for my enthusiasm. THese books from the 1940s and 50s have that certain something you alluded to in your review. They are worth collecting. All Alan’s and my books as well as other mountain titles are available at http://WWW.Tabletoppressbooks.com. Some of my books are down to the last ten copies. We are not reprinting. The long tradition of main range exploring is bein g continued by Alan’s sons, my wife’s son Chris as well as people like yourself. It is good to see. It is good to hear. May you have many more days with bracing air in your lungs, wide snowy vistas in your eyes, whistling wind in your ears, strength in your mind, stamina in your legs, muscles in your arms and love in your heart. Thank you again for a fabulous review and buying the book. Klaus Hueneke (OA AM) Tabletop Press, 2 Lambell Close, Palmerston, ACT 2913, ph 02 6242 0995. Email khueneke@bigpond.com.au. It is good to hear that Alan is well, that the tradition of exploring the mountains continues in his family, and for the additional information on books and the region. This book really is a lovely collection of poetry, maps and images. I invite you also to the English version of this mtkosciuszko.org.au website. You will find there a lot of information about the conquest of Mt Kosciuszko the highest peak of Australia, and about sir Paul Edmund de Strzelecki the explorer who gave the mountain its name. Now you’ve done it Cam. You’ll have to get yourself a copy of Elyne Mitchell’s Australia’s Alps.